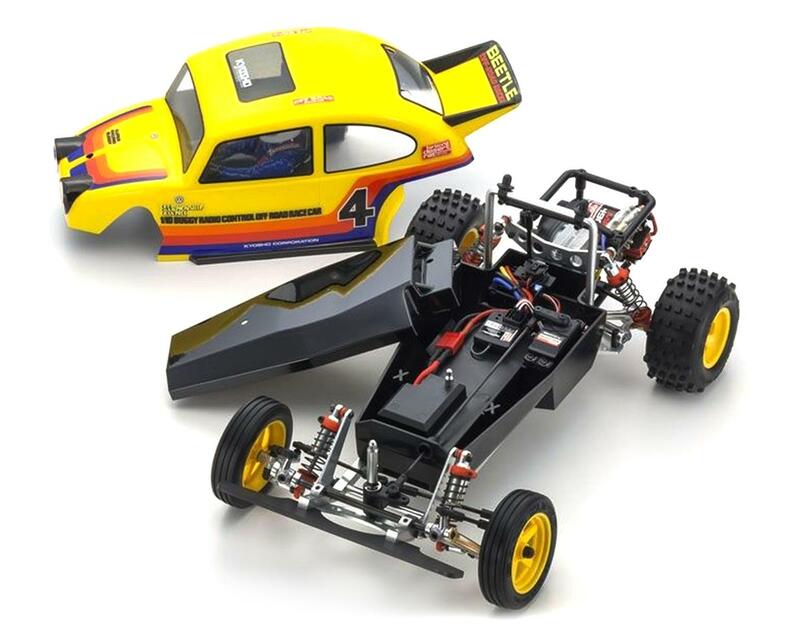 This is the Kyosho Beetle 2014 1/10 2wd Buggy Kit. Credited with taking the RC racing buggy category into the realm of pure motorsports, the legendary Kyosho Beetle is back, but with multiple modern day upgrades throughout. When it was released in 1983, the Kyosho Beetle left a mark with racers, and Volkswagen enthusiasts around the world. 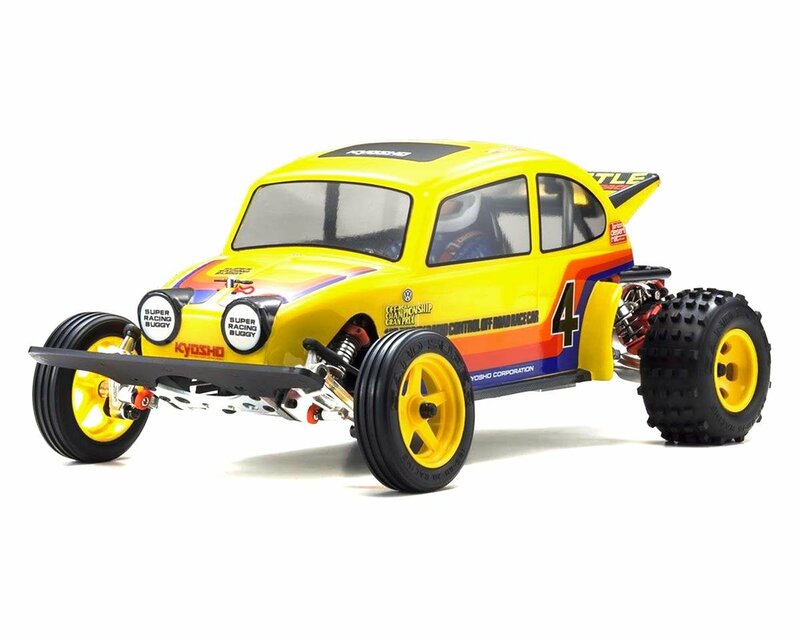 So Kyosho has brought this great machine back, in all its former glory with baja bug styling and unique chassis configuration. Compared to the original, the 2014 version features the latest in performance technology and sacrifices nothing on modern buggy racing tracks. Externally, it shares many of the features found on the original Beetle, but the forged 6061 T6 aluminum material delivers futuristic levels of strength, rigidity and durability. Following the original design, the Beetle 2014 features a two-piece die-cast aluminum gearbox that houses a gear differential, while the addition of a slipper clutch protects the transmission and delivers efficient traction that takes the Beetle’s control feel and durability to modern day levels. Precision 48 pitch gears, countersunk chassis and hex machine screws have all been chosen to deliver durability and simplified maintenance. The aluminum oil shocks feature stainless shafts to deliver a smooth shock stroke from top to bottom with great suspension performance, and nearly all the tapping screws and nuts have been replaced with quality hex screws. Like the original Beetle, the 2014 version is packaged as an unassembled kit. From veteran racers who knew the magic of the original Beetle, to modern-day racers and vintage enthusiasts, now everyone can discover why the Beetle 2014 commands respect, and is cherished by collectors world wide. 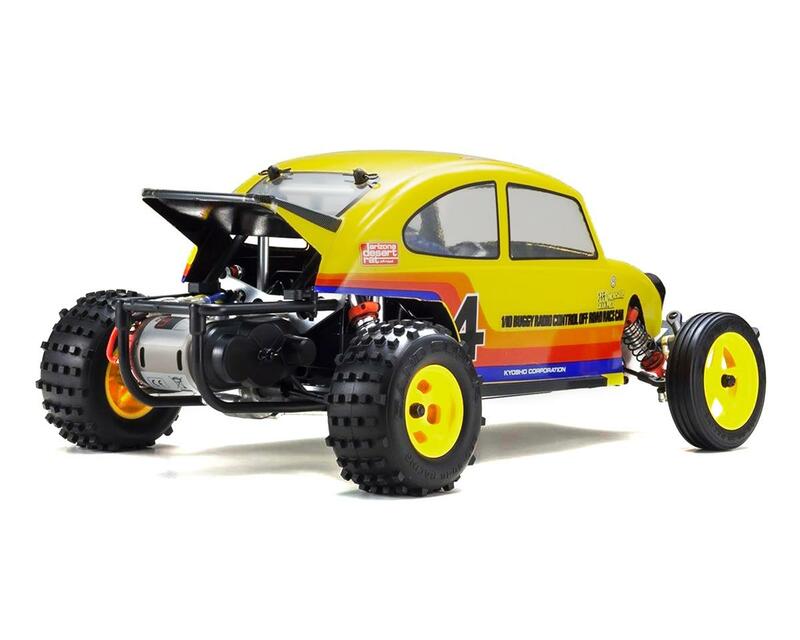 Revival of the famous Kyosho Beetle kit!